In a recent paper published in Nature Photonics, ICFO researchers Dr. Achim Woessner and Dr. Mark Lundeberg and their collaborators have developed a phase modulator based on graphene capable of tuning the light phase between zero and 2π in situ. 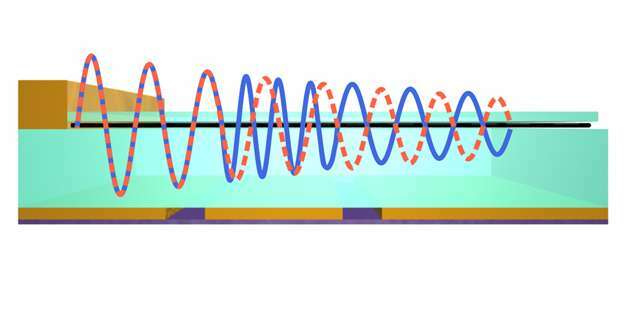 To achieve this, they exploited the unique wavelength tunability of graphene plasmons, light coupled to electrons in graphene. In their experiment, they used ultra-high-quality graphene to build a fully functional phase modulator with a device footprint of only 350 nm, which is 30 times more than the wavelength of the infrared light used for this experiment. A near-field microscope was used to excite and image the plasmons, allowing an unprecedented insight into the plasmon properties such as their wavelength and phase.